Superbly well built, and perfectly located, this home is ideal for a ski holiday in winter or walking/biking in summer in the excellent 4 Valleys. It sleeps 7/8 adults plus children in cots if required. It has arguably the best location in Nendaz, being less than 200m from main lift and shops/bars, plus a new spa and swimming pool complex, yet away from hustle, bustle and noise, and with amazing unobstructed views. Inside, it has been furnished with comfort in mind and to feel like a family home rather than a characterless holiday rental property. Hence the many books, DVDs, CDs and games all available for tenants' use, the fine quality art and furniture (traditional and modern), and an unusually large and well-equipped kitchen. The bare facts: outside and inside parking, ski room with boot warmer, 4 bedrooms, 3 bathrooms (plus further shower and wc), large open plan living/dining area, jacuzzi, sauna, Wifi, cable TV, and spectacular 'front row' views, enjoyed from huge glass windows and balcony access from every room. Floor plans available. We have equipped the apartment to be a comfortable and 'homely' place, so the furnishings and fixtures and fittings are top quality and there is plenty of art and furniture you would not normally find in a rental property. With wifi internet connection, it means you can also keep in touch with the office if you have to. We hope you have a great stay - and ask you please to treat it as if it were your own home. Golf: The best course is at Crans-sur-Sierre (which hosts a European PGA tour event each year). Others at Verbier and Villars - all within an hour or so by car. If you want one even closer (and flatter), there's one on the outskirts of Sion in the valley. Travel: You can fly direct to Sion airport from Stansted (Saturdays and Sundays in the winter) - which is under 30 minutes from the chalet. Otherwise, Geneva is the best bet, and can be reached fairly easily in 1 and 3/4 hours of very scenic driving through the Alps and round the stunning Lake Geneva, on top quality roads. In fact, Nendaz is very well situated for travelling around the wider region and in striking distance of plenty of beautiful places. En-suite with bath, power shower, WC and double basin. High ceilings skylight. 2nd with double-size power shower, rose head, and extra held shower, WC and basin. High ceilings skylight. 3rd with bath, shower, WC and basin. 4th WC and shower in sauna/jacuzzi room. Large private indoor garage with electric door (under chalet). Real log fireplace. Wooden floors in all bedrooms and living area. Under floor heating throughout. High spec bathrooms/power double shower with giant rose head. Natural stone wall and floor tiling. Unusually high ceilings in bedrooms/bathrooms (4m plus). Balcony access for every bedroom. Masses of books and DVDs. Fine furniture and large 8-seater oak dining table. High spec kitchen with above average storage/preparation space, marble tops. Large windows in main open-plan area opening onto wide 'wrap-around' terrace. Private ski room with seating, ski rack, drying shelves and all-important ski boot dryer/warmer. separate jacuzzi/sauna/shower/wc on the ground floor. The apartment is further away from the lift station than described, being around 300m rather than less than 200m as stated. This made it quite difficult to locate when we arrived in pitch darkness. It also makes for a tricky walk to the lift station downhill if conditions are icy although there is a free bus that can be used. We preferred to drive to Siviez after the first day where there is a large free car park and quicker access to Verbier. Access at the front is by a short steep series of steps which are tricky to negotiate when snowy and icy. At the rear, access is via the garage and then up two floors. There is no lift. The garage is fine for cars but it would have been a very tight fit for the ford transporter that we came in and there was really no room to manoeuvre it in as there was not much space between it and the crash barriers at the hills edge. There was ample parking outside though. The apartment is clean, spacious and well equipped with stunning views. There is one shower room upstairs and two in as bath attachments. The main one and the en suite in bath shower that we used were both powerful and there was plenty of hot water for 5 adults. The bedrooms were all fine although storage was limited in two. We were disappointed to find that there was no jacuzzi or ski boot warming rack as stated in the property description. We regarded these as strong “selling points” that led us to favour this property over others in Nendaz. The property specification should be immediately amended accordingly. These were the reasons for the deduction of one star from our rating. The sauna was not exclusive to the apartment, being used by other apartment tenants too. It would have been useful to have had some written instructions how to use it, as even after being shown how to by the property manager it was not clear. What would also have been useful would have been a simple guide to the property and resort written by the owner left in the property. When Included this is always useful for quick orientation and reference. Nentaz itself has plenty of restaurants, bars and shops and is a bit livelier than many ski villages without coming close to the apres ski of Austria. The skiing in the 4 valleys is excellent and caters for all abilities. We would be very happy to return. Comfortable and very good located chalet. 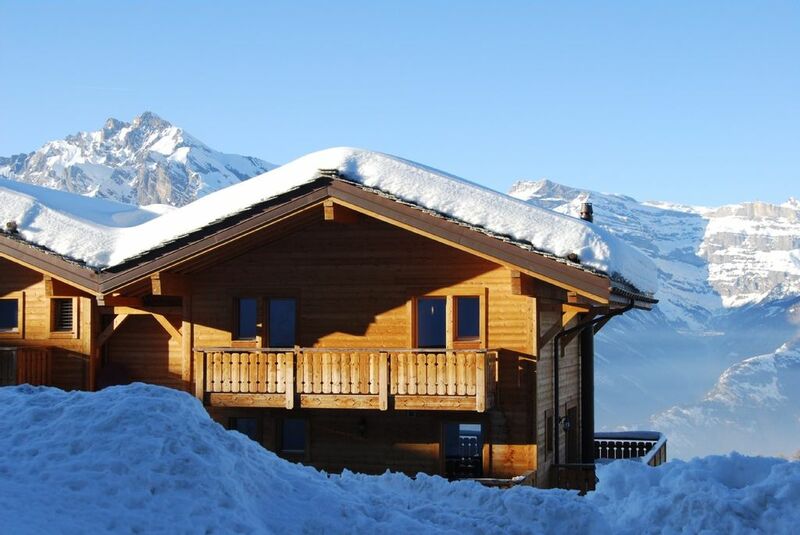 The chalet is very comfortable and clean, and it offers an amazing view over the swiss alps. Perfect customer service, very nice and efficient. The location is very good, close to the ski accommodations that can be reached by walking. We really did enjoy our stay and would highly recommend the Chalet Henri. We had a great week in Chalet Henri. We loved the place and the resort. really comfy and homely, but modern and well-equipped too. Ideal for our needs. The photos on the website hinted at the virew that lay in store, but the real thing was sometghing else... incredible! Location was perfect too: walking distance to everything and the new fanicular lift is only 100m away and takes you straight to the main shops and sports hall etc. nendaz is a pretty reosrt and has lots to do. we loved the skiing. Our group had one beginner and an expert, and both thought is a good area, so I guess that means it has somethng for everyone. We certaonly never got bored it's nice to have such a big terrain to expore. Switzerland is a more expensive than France, but it's so much nicer and frienldier - and if you feel like a treat, we would recommend this place! My boyfriend and I had a brilliant week at Chalet Henri with another couple. Fantastic location, right near the main ski bubble, and amazing views straight across the valley. Chalet was super clean, and luxurious and was always so lovely to come back to after a days skiing. The resort was fantastic with lovely restaurants, would recommend La Cabane - the Valais steak (local beef) was amazing! Nendaz is fast becoming much better known in the UK, but has long been a favourite of European skiers. It is slap bang in the middle of the marvellous 4 valleys region, which is one of the largest and most highly-rated areas in the Alps with over 400k of pistes + even more off piste. There's great walking/biking in the rest of the year, too - (lifts stay open until September). Nendaz - and this apartment in particular - is wonderfully located to explore the entire region. It's linked in to all the other areas on one lift pass and takes less time to get to the top of Mont Fort (3,300m) than it does from the much more crowded Verbier. The Printze region is really good and has some great restaurants. The ski schools are excellent & the 'kids' area' at the top of Nendaz (reached from the lift 200m from the chalet) is huge, safe, great fun, and has a very good bar/restaurant as well! Good creches (Nendaz & Siviez) if kids not ski age. Please contact owner for more information. Towels/linen/cleaning/local taxes: Property thoroughly cleaned on changeover. All charges payable to local agent on arrival - Cleaning/laundry CHF 225; towels/linen CHF 30 p.p.p.w; compulsory visitors' tax (adults: CHF 2.50 p.p.p.d., children 6-16: CHF 1.25 p.p.p.d.) A refundable breakages deposit of CHF 500 is payable to the agent on arrival.